Tram 71 at the Bell green Terminus looking towards Courthouse Green. Old Church Road can just be seen to the right of the tram. From the direction of the Sun, it was about 9.00am, so the overcoats suggest that it was probably a cold morning, although it is clearly summer. The bumper is painted white and there is a headlamp mask, so the picture almost certainly dates from 1940. Although female conductors had been employed as early as 1915, they are rare in tram photos. 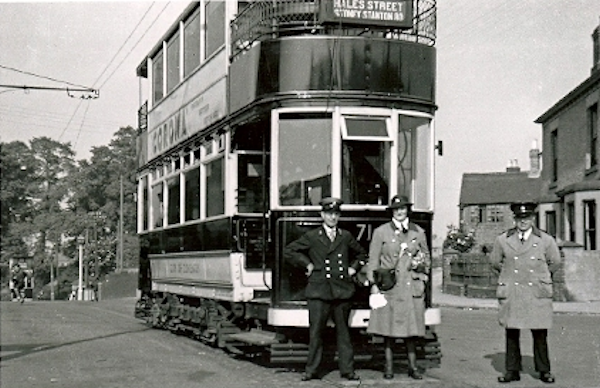 This photograph was supplied by Clint Hancox as part of a collection of tram pictures.